Once thought by many to be just a myth, a bogeyman to keep the young and rash from wandering the woods, the Swamp Witch has become all too real, abducting young people from their very homes. Witnesses say she travels to and from her hut in the Dread Swamp atop a living shadow. Now the PCs must make their way through the wilderness to confront the Swamp Witch. Is she the harmless hermit she claims to be, or is she practicing Black Magic? 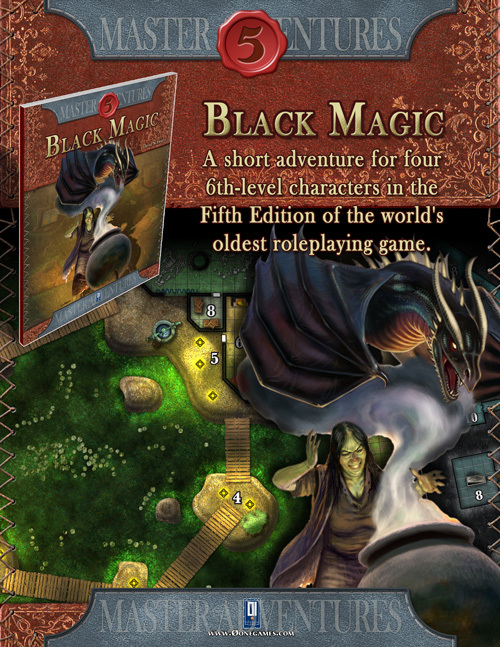 In Black Magic the PCs make their way through a swamp to reach the lair of an evil hag. In the Eerie Forest, the witch hut is located in the midst of the Dread Swamp, the largest body of water in the forest. 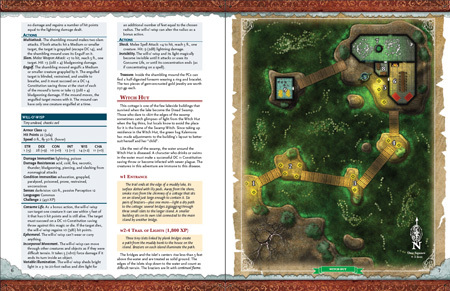 GMs are encouraged to place the witch hut in a swampy area appropriate for their campaign. This adventure is designed for four 6th-level characters in the Fifth Edition of the world’s oldest roleplaying game. Linking neatly in to the previous two adventures that 0one G ..